This recipe has been a long time coming. Low Carb Chocolate Chip Cookies should be a staple in every household, keto or not! There is always an event or gathering appropriate enough to bring these cookies, and even if it's not appropriate, bring them anyway. It took a couple, maybe several batches to get the recipe just right. We wanted there to chocolate and crispness in each bite. Learn how to make them below! What Makes These The Best Chocolate Chip Cookies? Unfortunately, these didn't come out right on the first try. Lucky for Matt, who ate most of them, it took me three times to perfect it. So what exactly makes this recipe the perfect one? Well, in the first two batches we didn't use xanthan gum and we found that they had more of a soft, bread-like texture. Doesn't make for a great cookie. But, after adding some xanthan gum, and using a combination of erythritol and stevia to get the perfect sweetness we created the perfect, crisp, homemade chocolate chip cookie! Incase you weren't aware we have a few great cookie recipes already lined up on our food blog, my all time favorite being the Maple Macadamia Nut Cookies! We also have an incredible Chocolate Fudge cookie and the most necessary holiday cookie of them all, Snickerdoodle. However, I have an inkling that this low carb chocolate chip cookie is going to steal the show! Why? It's the perfect cookie for all holidays and literally any day of the week. Kids love them, and they are classic enough that all adults love them too. Trust us, we know a good cookie when we make one! As a tip if you find yourself using Lily's Chocolate Chips you can omit the stevia altogether since the chips are already sweet! However, all I can really say is that you just have to make them to understand how great they are. You can even have a little fun and add in some nuts for an even tastier and crunchier low carb chocolate chip cookie! TIP: Parchment paper is a must if you want the cookies to spread evenly. If you don't plan on using parchment paper, spread them out to your desired size! 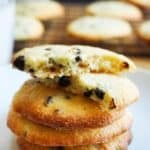 Recipe can be quickly added to MyFitnessPal - Search "KetoConnect - Low Carb Chocolate Chip Cookies"
Combine the almond flour, baking soda, baking powder, xanthan gum and salt in a bowl and set aside. Add vanilla extract, liquid stevia, erythritol and an egg to the melted butter and combine. Add the dry ingredients to the wet mixture in two batches and mix thoroughly ensuring there are no clumps of flour. Cut up the bakers chocolate into as big or as little chunks as you want and add it to the batter. Combine. Place parchment paper onto a baking sheet and using a cookie scooper scoop 12-13 cookies onto the baking sheet. No need to press them out - they will spread in the oven. Let cool for 15 minutes and enjoy! As they cool they will harden.